The tenancy was due to start the following morning…. The pre-tenancy work was all done – kitchen and bathroom sparkling, oven and hob specialistly cleaned, looking like new, carpets shampooed. Not this time. As soon as the door was opened, an ominous humming became noticeable – the apartment was full of wasps – hundreds of them. A buzzing blizzard of black and yellow stripes. What to do? It was now early evening – the tenant was due to arrive in the office tomorrow, hoping to pick up the keys at 9.00. She had the home number of our specialist pest controller who agreed to go first thing the following morning. He would take some Polyfiller with him. 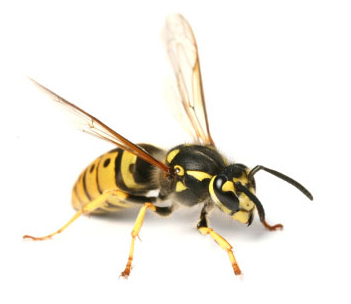 (The wasps nest was in the roof, and the wasps had chewed through the ceiling, hence their sudden debut). But there would be a lot of dead wasps, he warned us. The letting team were frantically busy with the Summer rush of people looking for property to rent in Abingdon and surrounding villages – but they managed to contact the tenant and explained the situation. Could the removal company be delayed by two hours? Yes it could! The tenant arrived for the keys and Nathalie went with him to the house and hoovered up the last of the dead wasps as the furniture was being moved in. One last hitch. The tenant had brought a fridge freezer with them that they couldn’t get up the stairs. A second, rather burlier, member of the Finders Keepers team went and got his shoulder under it.